(AINA) -- The province of Nineveh is going through tragic and exceptional conditions, particularly its minorities, national, ethnic, religious and linguistic groups, such as the Chaldean Assyrian Christians, Yazidis, Shabak, Turkmen and the Kakai in the aftermath of the control by ISIS terrorist groups along with other armed groups of Mosul - the center of the province of Nineveh in 06.10.2014, and after they extended their sway over larger areas of the same province, and to the cities and other areas in the provinces of Anbar and Salahuddin, Diyala and Kirkuk. 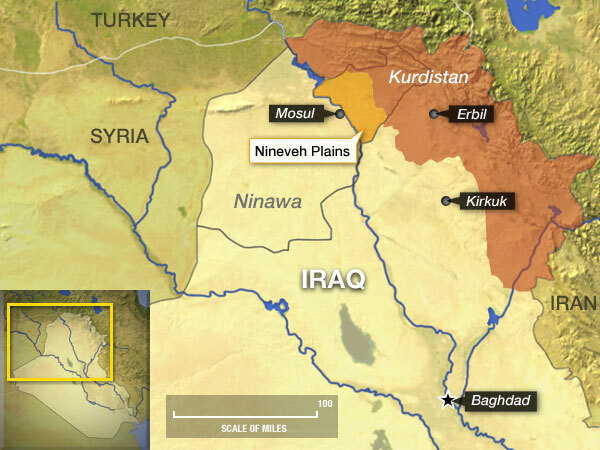 These serious developments have deepened the crisis that befell all minorities in region known as the the Plain of Nineveh that surrounds the city center from the east, north and west. It made them live in dire conditions of human suffering due to the acts of ethnic and religious cleansing, mass killings, forced displacement and crimes against humanity, perpetrated by ISIS and other militants groups causing mass exodus back and forth from areas of the minorities and leading to further deterioration in the basic services. On the other hand the events have turned their region into a war zone and caused it to be in direct contact line with the armed groups of the Islamic State declared in the province of Nineveh and and the forces of the Kurdistan Region who, as of the early days of the crisis, withdrew from the Plain of Nineveh, the "disputed area" between the KRG and the federal government in Baghdad since 2003 in accordance with Article 140 of the Iraqi Constitution where minorities have been exposed to continuous threats and attacks despite the presence of Peshmerga forces of the Kurdistan Region after the tenth of June, 2014. The recent developments were accompanied by a systematic emptying of the center of Mosul city of all of its minorities for good despite their history in the city, such as the Yazidis, and Christians, who are the oldest of its indigenous population, and whose roots extend deep into the history of Nineveh, the capital of the Assyrian Empire, and its sister cities of Assur, Nimrod, and Dur Sharrukin, where acts of killing, torturing, and cleansing were exercised against them. This has caused and continues to cause unprecedented mass exodus to the outside and to the Diaspora, with unknown, uncertain and frightening future, threatening their very existence in their homeland. All of this, raised a lot of voices both at home and in Diaspora, from pressure groups (lobbies) organized by communities scattered in many countries around the world, especially among the Chaldean Assyrians Christians, calling upon the international community to provide an "international protection" or a "safe haven" for minorities, specifically in the Nineveh Plain. The demands for international protection or finding a safe area mean that there be a forum of "international intervention", which is supposed to be decided by the United Nations, and specifically through the Security Council. Therefore, these demands are expected to be accompanied by a clear vision, and a comprehensive assessment, taking into account the international legal standards and political considerations that are required to find an acceptable formula for the proposed international protection. This paper is a contribution to the study and analysis of the subject and an attempt to provide a specific vision. It starts with an attempt to briefly define the idea of "international intervention", its forms, justifications, mechanisms, and functions, with an attempt to review the models of "international intervention" previously implemented in different regions of the world.